My recent explorations of England’s military experience in the War of the Spanish Succession have been eye-opening. First, my initial training in Louisquatorzian France poorly prepared me for the plethora of documents created by late Stuart England’s vigorous public sphere. Early bibliographical works (William Morgan’s A Bibliography of British History (1700-1715) with Special Reference to the Reign of Queen Anne and Robert D. Horn’s Marlborough: A Survey. Panegyrics, Satires and Biographical Writings: 1688-1788) gave us a glimpse of such riches, but only a few scholars had the time and resources to attempt more than a sampling. The explosion of digital sources (both printed and manuscript) has finally allowed historians today to actually catch up to these early bibliographical catalogs. Given enough time, we can read more published material on the time period than almost all of those alive at the time were able to do. We not only have access to a wide range of archives from many perspectives, but also comprehensive collections of publications saved in disparate libraries around the world. This isn’t the same as truly understanding how contemporaries thought about every issue (and leaves us particularly uncertain about the divergence between print and oral culture), but it does allow us to reconstruct their worldview much more accurately and comprehensively than ever before. More than 8,000 individual issues of 37 English papers (though only a few were in print through the entire decade). This doesn’t include regional papers outside of London. A few hundred maps, plans and illustrations (I don’t have an accurate count since I haven’t entered all these into my bib database yet, but I do have them indexed in Picasa). Who knows how many paintings, statues and other physical artifacts (muskets, cannon, fortifications…). As a grad student I’d been put somewhat off the track by what the published sources indicated: most English-language books on the Spanish Succession focus on biographies of Marlborough (and most of these restrict their source base to the Blenheim Papers), while most published collections of documents tend to only reproduce his outgoing correspondence. As I delved into the Blenheim Papers I recall being surprised at all of the interesting information coming into Marlborough, far more than what he sent out. But when the historiography continues in its hero-worshiping vein, and when a grad student stays focused on the biographical literature, it’s not hard to lose sight of this bigger picture. What all these biographies ignore is the immense amount of information coming into important individuals: a wild guess would be ten times the amount of outgoing correspondence. An Englishman purchases issue number 1438 fresh off the press, on July 22 (Old Style since he’s in England, but not July 20th, since newspapers were issued on the last day listed in their banner). That same purchase would have occurred on the same day of the week (Saturday) in the Netherlands, but on the 2nd of August (N.S.). From the header, the Englishman learns that the first article he’s about to read was received in England the day before (i.e. July 21 O.S. ), sent over in a mail shipment from the Netherlands. Fresh news it seems. If queried, the reader might recognize that the Dutch mail received in London on July 21 O.S. left the Netherlands who knows when (presumably within a day or two, unless it was waylaid somehow), but arrived in London on August 1 N.S. from the courier’s perspective, since the Dutch used the Gregorian calendar rather than the Julian. In this Dutch mail was presumably a copy of the Paris Gazette from the 26th, or else someone copied the report from their copy of the Gazette. More uncertain is which Paris Gazette the paper refers to. Option 1: the Gazette was published in France on July 26 (or July 15 O.S., since France was using the Gregorian calendar). Option 2: the Gazette was published in France on June 26 N.S. Since I don’t have either issue of the Gazette de France (which I believe is what the Flying Post is actually referring to), I can’t tell for sure, since none of the other stories in this Flying Post issue are taken from that issue of the French paper. On the second page there is a separate news story with the byline of Paris, July 26, which would seem to support a July date for the Gazette as well. If one had to guess, they’d need to decide whether there was more likely to be a delay between Spain and France, or between France and England. A 47-day delay seems rather long from Spain to France, but on the other hand, a 25-day delay from France to England seems even less likely, especially if we imagine that English recipients would want to receive the most recent news from France. Presumably as well, the editor of the Flying Post had the ability to get copies of the Continental papers soon after they were published, since all the English papers constantly reprinted Continental reports. My personal guess would be the delay would be greater on the Spain-France leg than on the France-England leg, especially since the French press was controlled much more tightly than the English, and that a week-long delay between France and England is more realistic than a three-week delay. But I can’t recall coming across many examples from the archives that would help out. Thus the Madrid article published in the Paris Gazette appears to have been written forty-seven days earlier, on June 9 N.S. So we have a report written in Madrid, traveling to France, being published in a (much later) French newspaper that then made its way to an Allied source somewhere (possibly the Low Countries), but definitely sent via the mail transferred through the Netherlands to England. What explains the delay from Spanish quill to French printing press? Who knows – all sorts of possibilities. It might be interesting to look for patterns by newspaper, location/type of source, etc. Anybody know if the history of the press has done this already? There sure would be a lot of data points. To top it off, the original Madrid account of June 9 N.S. discusses events that took place recently (i.e. early June). Some occurred on identifiable dates and others at an indeterminate time in the recent past. A few events mentioned in the report include actions that had not yet taken place at the time of the writing, but were projected to occur shortly. So, if these calculations are correct, our English reader would be reading news that was almost two months old, and likely have read more recent reports in the meantime in other newspaper issues. Note as well that, at the least, the Madrid account was translated from French into English, or, depending on the original author, it may have been first translated from Spanish into French, then into English. Yet another reason why you need to go back to the original. Most of the other stories in the post were likely sent from English correspondents and thus in English, although most of their sources were undoubtedly Dutch (likely in French if written) and German. Two dating systems (O.S. and N.S. ), requiring some background knowledge to know which system is being used when. Bylines only help so much, and even less if a month isn’t given (especially when delays of a month or more are possible, and when the dates are in the first or last week of the month, given the 11-day variation). Date of events being reported, rarely with a month given (and the range of dates under consideration span across two months or more). Sometimes the accounts only mention the day of the week it occurred on, e.g. “last Sunday…”, which requires other contextual information to determine its date. Date of report being written/date of composition. Sometimes internal evidence of the events being reported can help you establish the date of composition, but not always. Date of report being sent. Time report takes to travel (i.e. transit time), which is variable even on the same route. Date of report being received. Date of report being published (English news of the Continent will always be delayed somewhat, and this delay is variable). There might be a delay here depending on staffing levels, the amount of translating required, and various other factors. Date report is read by reader. A July 11 story from Augsburg on the Allied army in Bavaria – presumably you need to know whether Augsburg used NS or OS. The language makes it sound like the report is coming from a source within the town, rather than from the Allied army nearby. But we don’t know the extent to which such reports are paraphrased for publication. A July 16 account from the Allied camp on the Danube – I think the Allied army was generally using N.S. consistently by this point, but can’t be sure without knowing the author or checking the internal dates, e.g. figuring out when Prince Maximilian of Hanover arrived (what date “last Sunday” was), or finding out when Cutts et al arrived in camp. In other words, you need to get out your calendar if you care about the details. A July 16 story from Nordlingen (OS or NS?) on a Dutch hospital (in Bavaria). A July 16 story from Vienna – presumably N.S. because an old style date would put it several days after the O.S. Flying Post was published – unless it was an older account. Here too, internal evidence would help determine the correct date. A July 20 account from Marlborough’s camp at Aicha. So we have two different accounts four days apart from Marlborough’s army in the same newspaper issue. And let’s not mention the fact that you’d have to do these calculations for each issue of each of the dozen newspapers that you read. But such is the life of a historian. But more to the point – was this the life of a contemporary Englishman? Why was this old account from Madrid published? Does it say something about the paucity of news from Spain? Is the content (from the enemy’s Court) important enough that it is ‘timeless’?…. Why didn’t the publisher bother providing the reader with reminders of which dates are O.S. and which N.S.? Too much work? Everyone mentally calculated it automatically? Readers weren’t expected to care about the chronology? The last possibility is particularly disturbing for a historian, and certainly contradicts the attention to dates and chronological sequences indicated by the reports themselves, as well as those included in campaign journals published contemporaneously. What does all this tell us about the contemporary English who read all these papers? The letter is intended to sum up the situation at the end of the first campaigning season in 1704 as the armies were going into summer quarters. This means that the letter to Paris would be dispatched during the hot season which could slow down the delivery dramatically. In addition there might have been some reluctance in England to face up to the disastrous first effort of the allied expedition to the Peninsula. Due to faulty dispositions, two Dutch battalions (Fagel and Holstein-Norburg) had been cut off and captured at Sazedes, Stewart’s regiment had to capitulate at Castel do Vide, and Stanhope’s at Portalegre. The order in the letter to demolish the two latter fortifications would be confimation of their fall, but even at the date of publishing in the newspaper, I have only seen an unconfirmed rumour about Castel do Vide (in London Gazette) and nothing about Portalegre. The political allegiance of the Flying Post was Whig and Stanhope was a leading young coming man in the party. I could see an attempt at managing the delivery of bad news at play here. Do you know if the Post Boy had broken the story from a Tory perspective? Thanks for the insight. I don’t have time to do too much research on this and didn’t want to do a thorough comparison with other papers and issues, but since you asked… I only have one issue of the Post Boy from 1704, and only one from 1705 for that matter. I have a fuller run of the Post Man (I’ve seen conflicting views of whether it was Whig or Tory and haven’t had time to research it more thoroughly). In any case, its July 11-13 issue has a letter from early July from Lisbon from the Allied perspective that gives some details on the ops at the time – presumably a direct naval connection allowed this much more rapid transmission of news? And the fact that it wasn’t routed through France. Other letters in the July Post Man with news from Spain include 7/1-4 and 7/8-11. FWIW, the Daily Courant of July 24 also includes the Madrid article in question, specifying that it came from the Paris Gazette of July 26. Not sure how to interpret the fact that the exact same account would be published at about the same time in different papers: a single shared source? concurrent arrival of multiple copies of the Gazette in England? collusion among the editors? copying the other’s account? the Daily Courant needs to publish everything it can since it was a daily?… The Daily Courant was much more likely to attribute its sources, and heavily relied upon Continental papers such as the Amsterdam Courant (i.e. the Gazette d’Amsterdam). 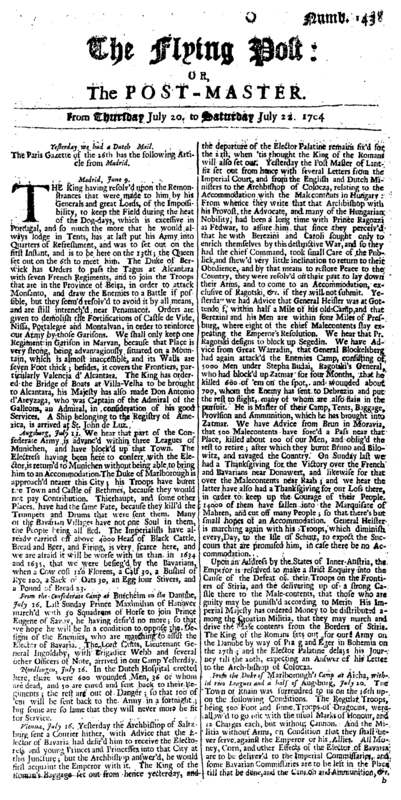 The London Gazette “published by authority” (i.e. the semi-official state paper, run out of the Secretary of State’s office) of July 10-13 has a letter from Estremos dated June 28 NS on operations as well, also a report from Lisbon July 2 in same issue. Going back to my question about why they’d publish old news, it’s possible that this French account was useful in fleshing out events from the enemy’s perspective – if both the Daily Courant and the Flying Post reprinted it, it must’ve been considered newsworthy overall. It’d be interesting to compare coverage of theaters and events by paper to see how much influence the political proclivities of the editors/printers had. As well as to make direct comparisons of coverage of the same events. Certainly Defoe and others commented quite a bit on the accuracy and partisanship of different published accounts. A very verdant informational ecosystem – again, something I wasn’t expecting given my French background. Tangent: It’s amusing to see how raw these reports are. On more than one occasion you’ll read that the enemies abandoned their siege of X, and in the very next letter, you’ll be told that the town has been captured – must’ve been fun trying to adjudicate wagers based on widely-varying news reports. The 7/8-11 issue above talks about the Duke of Anjou abandoning his siege of Castel de Vide, and then in a PS to the same letter it says he’s returned to the siege and the town isn’t expected to hold out ten days. As I speculated in the map of Spain post, it must have been whiplash for those newspaper readers. I wonder if that (and all the rumors) had an influence on how they read the papers, perhaps made them cynical about believing any reports that didn’t fit their preconceptions? I think there’s been a bit of work on the early-mid 17C English news-reading public, but I haven’t had a chance to look through it yet. I have always seen the Flying Post as Whig and Post boy as Tory. I find the honesty in the rawness to be the main attraction. There is such hopes and conjecture in how news are reported. As you say, the wait for confirmation must have seemed unbearable. Of course, in the summer of 1704, there had been some minor successes the previous year and Marlborough was marching around Germany to no clear purpose. This would have been a time when the Country Tories thought their time would come….